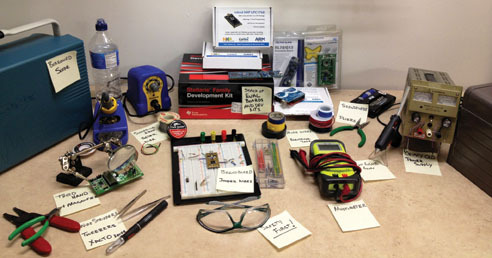 In this final part of his Internet of Things Security article series, this time Bob returns to his efforts to craft a checklist to help us create more secure IoT devices. 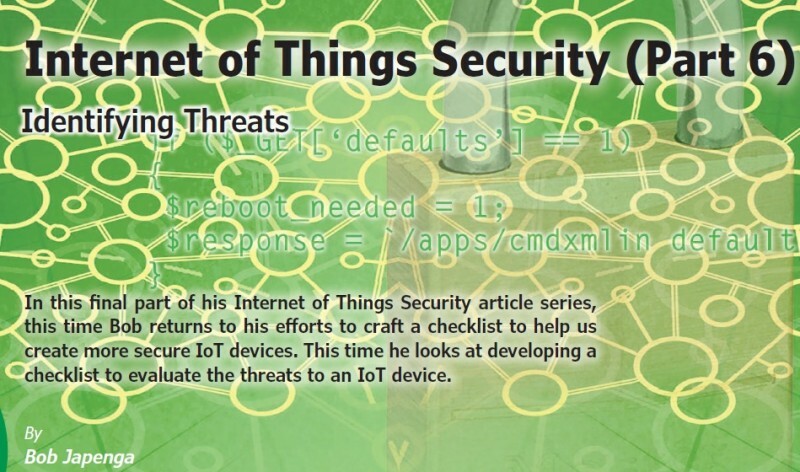 This time he looks at developing a checklist to evaluate the threats to an IoT device. A number of years ago (there were woolly mammoths around if I remember correctly), I attended a conference on the Ada programming language. Ada was created for the United States’ Department of Defense to replace the myriad of programming languages that were deployed by the DoD at that time. The language was named after the first programmer, Augusta Ada King Lovelace, a colorful character in her own right and the only legitimate daughter of the poet Lord Byron. Ada is credited with publishing the first algorithm for use on a computing machine: Charles Babbage’s famous analytical engine. Although I remember nothing from the breakout session on algorithms, I have never forgotten this principle: “There are some things that we just don’t care to address when designing embedded systems.” Certainly, there is much to be said for thoroughness in design, but when we—with well thought through analysis—determine that some aspect of a design is a “don’t care” we need to let it go. In designing secure IoT devices this is a very important principle. The threats are diverse and difficult to number. The assets are important and of differing value. This month we will continue to build our checklist for IoT security. Last time we created a checklist to help you identify the assets that you want to protect. This month we will add to that checklist with some questions to help you identify and quantify the threats. We need to start with definitions. A good working definition for a threat would be: “a person or thing likely to cause damage or danger.” Although this is a good definition, for the purpose of building our checklist, I want to expand upon it a little. Here’s why: In most cases “I don’t care” who the threat is, nor do I care what their capabilities are. Keep in mind that, if there is a threat with very little capabilities, that threat could get passed on. They can always sell either their knowledge or their access to the device to someone who has the capabilities to create a security breach with the device. Let me illustrate that. Imagine there are two threats: One is a disgruntled former employee with little or no capability of reverse engineering your design in order to find a security flaw. The second is an organization with deep pockets and highly skilled hackers. If any of the assets that we identified in the first part of the checklist are worth a significant chunk of change, the former employee can always sell what they have to this other organization. With all that in mind, in general “I don’t care” about who the threat is. But I do care about the activities of these threat agents. This is in line with the way the OWASP Top Ten IoT Security Threats is laid out. The Open Web Application Security Project (OWASP) is a worldwide organization focused on improving the security of software. I introduced OWASP as a valuable resource in my August 2016 column (Circuit Cellar 313) when we discussed their list of the top ten security vulnerabilities. The list was updated in 2017 and worthwhile to review . 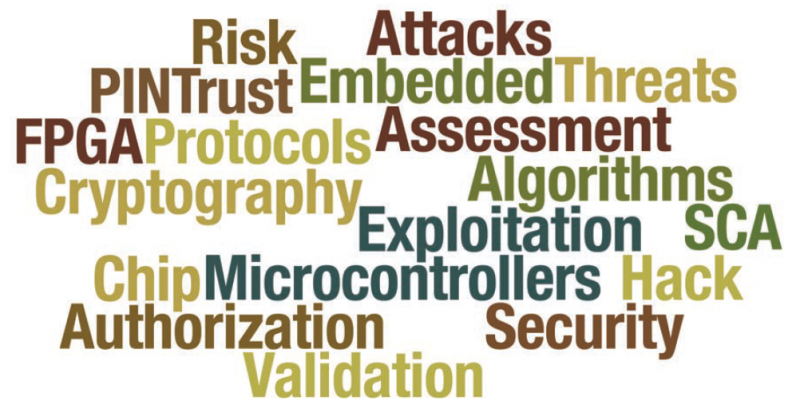 OWASP also provides what its calls the top ten threats to IoT devices. We will look at these a little later in this article. They agree with my assessment that we don’t care who it is or what their capability is. What we care about is the action that they can take. 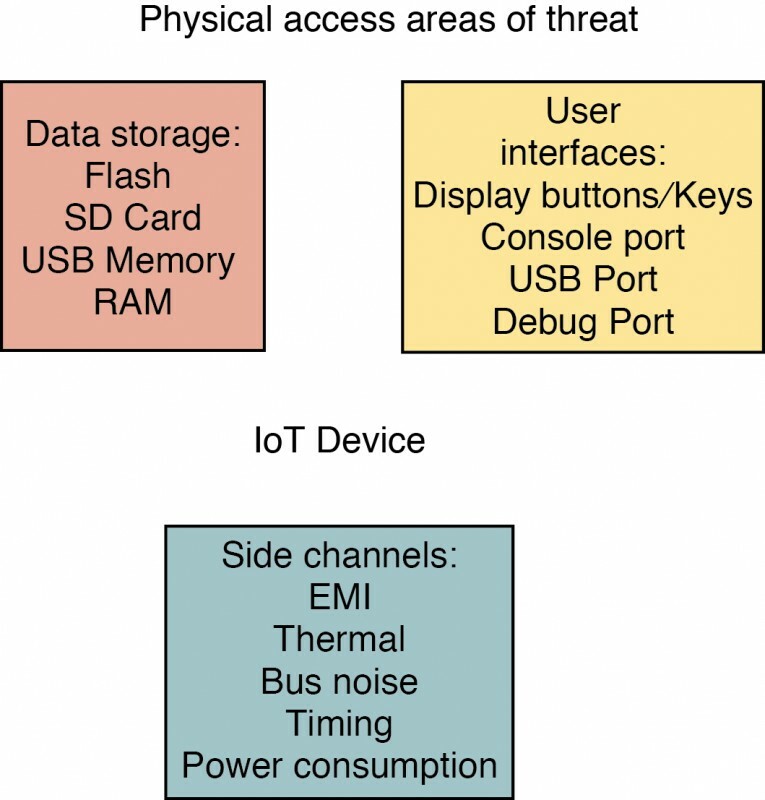 Shown here are the five areas of threat I’ve identified for IoT devices. 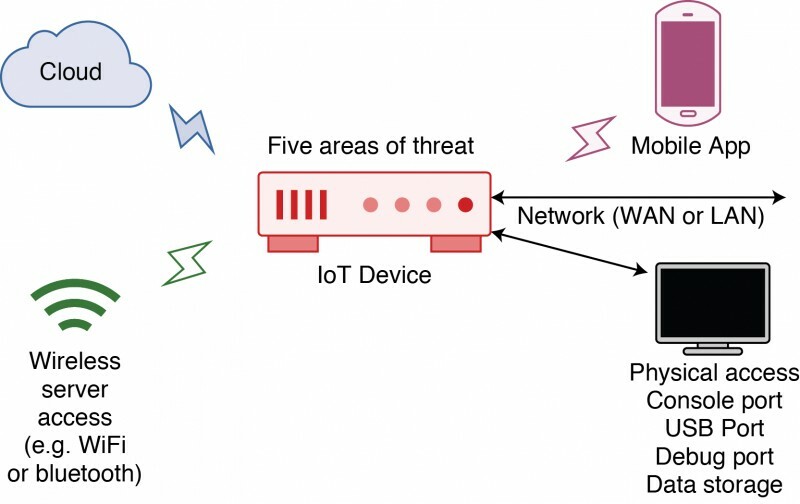 When thinking about threats to the security of our IoT device, I would identify five areas of threat as shown in Figure 1: access to the physical device; access to the wireless services on the device; access to the network (LAN or WAN) the device is on; access to the cloud server used by the device; and access to the mobile app used by the device. Anyone who has access to one or more of these is a threat agent. So, the beginning of our checklist needs to analyze what harm could be done by such a threat agent who gained access to any of these five areas of threat. Not all of your IoT devices have all of these areas of threat but most have a majority of them. For each of the areas of threat we need to ask the question: What would be the potential cost if someone with a lot of time, highly skilled hackers and a lot of money got access to one of these areas of threat without permission? 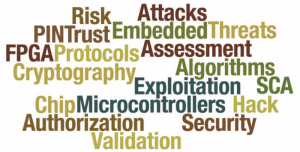 This provides the first five elements of the Threat portion of the IoT Security Checklist. Let’s look at each of these. Physical access: Not all IoT device designers will consider physical access to the device an area of threat. For example, we are currently working with a client who has determined that there is very little risk of an unauthorized person having physical access to their device. For most cases this is true. The device is only touched by employees and is physically inaccessible to everyone else. But I have not pushed them to protect the assets accessible through physical access for other reasons. I have gone along with that assessment because the assets available inside the device are minimal. But if the assets were valued higher, I would push back more strongly primarily due to the potential of a disgruntled or greedy insider handing the unit off to a qualified hacker. Shown here are the access areas of threat if physical access is a threat area for your device. If physical access is a threat area for your device, then the following access areas portrayed in Figure 2 need to be protected: access to data storage; access to user interfaces; access to USB ports; access to console ports; access to side channel information; and access to debug ports. 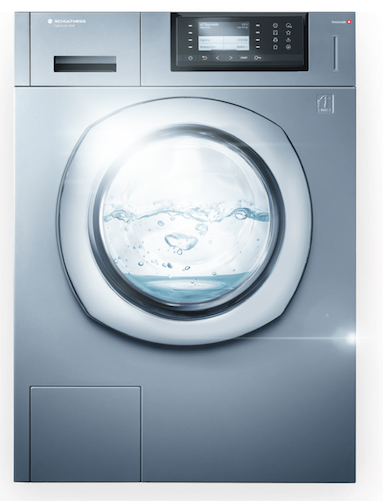 Mobile app: Many of our IoT devices have a mobile app associated with it. Although not strictly part of the IoT, it is certainly something that needs to be considered when designing your IoT device. Certainly, one approach is to limit who can put your mobile app on their phone or tablet. This certainly provides a great physical barrier to access. But the integration of Google’s Play Store and Apple’s App Store with your phone and tablet makes for very easy deployment and is very tempting to us designers. Surely the next line of defense is to drastically limit what the mobile app can access. Again, this is the power of the mobile app interface and you hate to lose it. Requiring a username and strong password is your next line of defense. For now, our job is to identify what harm someone bent on destroying your business would do if they were given unlimited access to your mobile app. How your mobile app communicates to the device is another concern we’ll look at next. Wireless access: Your IoT device may provide several wireless ways to connect to it: cellular, Wi-Fi, Zigbee, Thread, Bluetooth, IrDA and Near Field Communication (NFC) are some of the most common. At this point in our checklist we need to ask: What if an unauthorized person got on your device wirelessly? What harm could be done? What if someone could perform a man-in-the-middle attack? The most recent Bluetooth hacking technique  shows us that even secure transmissions can have holes in their implementations allowing for man-in-the-middle attacks. So, we cannot just rely on secure transmissions as our only source of protection. I think about this every time I connect over Bluetooth to my OBD2 (on-board diagnostics) interface in my car. What would happen if someone could get on that interface and muck with my on-board computer? There’s no doubt that providing good access control through usernames and passwords, encrypting and authenticating all traffic and limiting physical access are all in your arsenal of protection. For now, we are concentrating on evaluating the harm nefarious access over the wireless interfaces on your IoT device could do. Cloud access: Like mobile access, your cloud access is not strictly part of the IoT device. But again, we must pursue the questions: What if an unauthorized person got on your cloud interface? What harm could be done? The cost of that harm will help you to evaluate the amount of security you need to provide to the cloud interface. Clearly, we don’t want to use unencrypted transmissions. HTTPS provides encryption for us. But we found that on one of our major projects the cell modem chip only supported HTTP. So, we needed to encrypt the transmissions ourselves. Secure user access is pretty standard for cloud interfaces. But again, don’t rely on these layers. Seriously address what harm a malicious hacker intent on destroying your company could do if they had full access to your IoT cloud interface. Bob’s IoT Checklist can be found here. 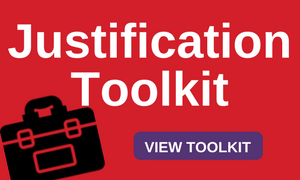 Tools and templates you can use to show the value of this event and justify your attendance. Ready to register for Embedded Systems Conference (ESC) Boston but need help getting the OK from your boss? We have got some handy tools you can use. Use promo code KCK when you register to save 20% on an ESC Boston Conference pass! Get the OK, then get your pass! Join forces with your colleagues to get the green light. 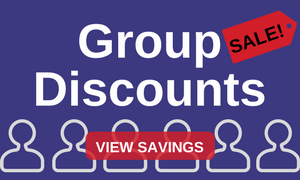 For a limited time, you can get up to 25% off current pricing when you register a group of three or more. New Englands Largest Embedded Systems Conference Returns! Plus! Our lowest rates on conference passes. Save big when you register now. Embedded Systems Conference (ESC) Boston is back! Its your once-a-year opportunity to explore the latest innovations, learn from renowned industry experts, and connect with the peers and partners that can advance your projects  and your career. Get your free expo pass today for the nations largest embedded systems event. PLUS! Use promo code KCK when you register to save 20% on an ESC Boston Conference pass. From embedded hardware/software to IoT and connected devices, get up to speed with the strategies and techniques that turn concepts into competitive products. Leading suppliers including Rhode & Schwarz, Green Hills Software, and Express Logic will showcase the latest in design tools, sensors, and more. Source everything needed to work faster, smarter, and cheaper. Take your know-how to the next level with highly immersive education over two-days and four-tracks. Topics include embedded hardware/software, connected devices and IoT, and new technologies. From casual chats on the floor to swapping tips at networking events, make new contacts, fast. Plus, get paired up with the suppliers you need most at the new Attendee-to-Exhibitor Matchmaking event! 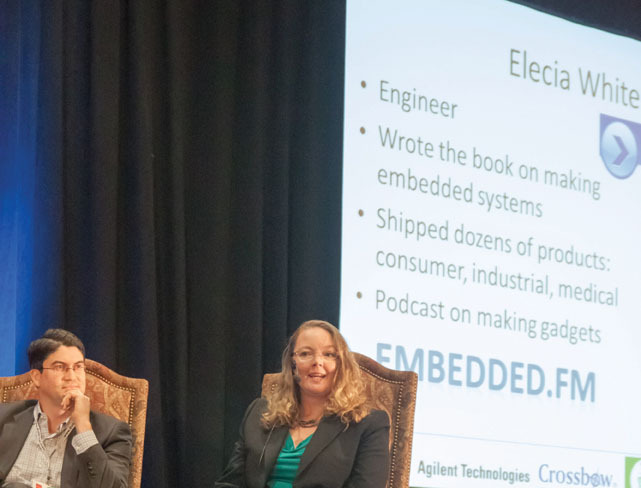 Embedded Systems Conference (ESC) Boston takes place alongside Design & Manufacturing New England and BIOMEDevice Boston, to create one end-to-end advanced design and manufacturing showcase. More than 450 suppliers and 4,500 industry professionals on one show floor. Your expo pass gives you access to it all  for free. Debugging an embedded system can be difficult when you’re dealing with either a simple system with few pins or a complex system with nearly every pin in use. Stuart Ball provides some tips to make debugging such systems a little easier. Debugging a microcontroller system can be difficult. Things don’t work right and it often isn’t even clear why. Was something initialized wrong? Is it a timing issue? Is there conflicting use of shared resources? Debugging is more complicated when there are limited resources. If all the processor pins are used, what do you connect to? How do you get debug information out of the firmware so you can see what is going on? This article isn’t about debugging when you have Ethernet, USB, and Bluetooth interfaces available, or when you have a full-speed emulator. This is about debugging when there aren’t many resources available—simple systems with few pins, or more complex systems with nearly every pin already used for something. Figure 1: This is the schematic for a serial port RS-232 driver. It’s a standardized circuit that plugs into a header on the board to be debugged. There are two general ways of debugging an embedded system. One is postmortem, looking at the state of the system after it has failed or after it has stopped at a breakpoint. The other is real-time, debugging while the system is running. Each has its own place and its own set of challenges. Generally, the two methods use different debug techniques. A postmortem debug happens when the motor is stalled, the software can’t recover, and you have no idea why it happened. You want to know the system’s state and how it got there. Setting breakpoints is a method used in postmortem debugging; you stop the system and look at the static state after a particular point in the code is reached. Real-time or active debugging is more appropriate for looking at timing issues, missed interrupts, cumulative latency issues, and cases where the system just does occasionally does something strange but doesn’t actually stop. Real-time debug can tell you how the system got into the state that you are trying to analyze using postmortem methods. If you can capture enough information while the system is running, you have a chance to turn a real-time problem into a simpler static post-mortem analysis. This article appears in Circuit Cellar 312, July 2016. Download the complete article. 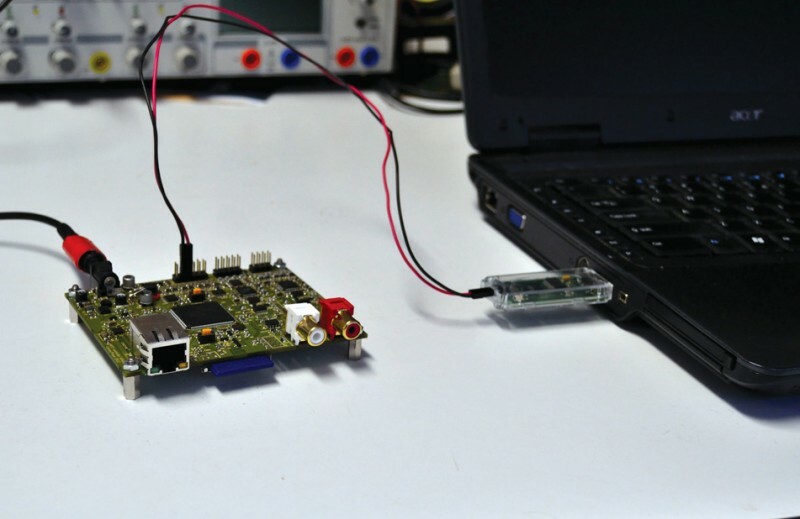 An asynchronous serial port may be the most common debug tool used in the embedded world. Most microcontrollers have at least one serial port built in. The serial port has limitations. Its speed is limited and it requires level translation to connect it to the RS-232 voltage levels of a PC. In many cases, you might not want to put the RS-232 driver on your board. You don’t want to use the space required by either the IC or the RS-232 connector, especially for something that is only used while debugging. One way I’ve solved this problem is shown in Figure 1, which depicts just a Maxim Integrated (or Texas Instruments) MAX3232 RS-232 driver IC connected to a DE9 connector. The other side connects to a four-pin header. This is connected via a cable to the embedded system to be tested. This allows the embedded system to have just the four-pin connector wired to the microcontroller serial port pins, power, and ground. You plug in the external circuit when you need to debug and unplug it when you are done. There is nothing special about this circuit, it is exactly the same as you might put on your microcontroller board. Except you don’t need the space on your board for this. The circuit takes power from the microcontroller board via pins 1 and 4 of the four-pin Molex connector. The connector indicated is polarized so you can’t plug it in backward. I’ve standardized on this in my embedded systems at least where the serial port is used for debug or download. Although I used a connector with 0.1” centers on the interface board, there is nothing to prevent you from using a 2 mm or 0.05” connector, or even a row of pads at the edge of the board being debugged. You just have to make a cable that has the Molex connector at one end and whatever you need to match your embedded board at the other end. 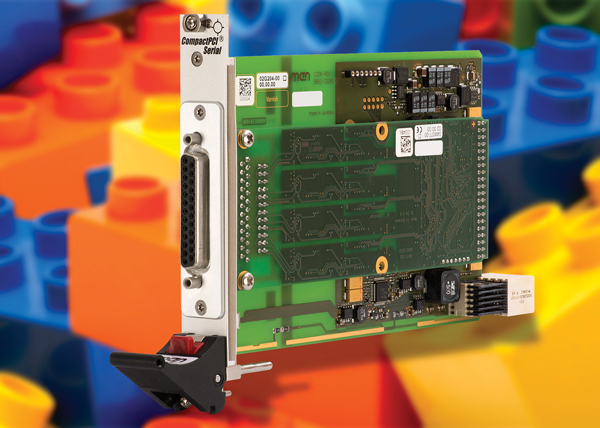 You can keep the driver board in your toolbox, put the connector on your embedded system boards, and you have it when you need it. You can house the board into a plastic project box. In one case, I built one on a narrow piece of perforated project board, and covered the entire thing in heat shrink tubing. It has the right-angle Molex connector on one end, and a short cable with the RS-232 connector on the other end. I keep that one in my desk drawer at work. Many complicated motion control and power electronics systems comprise thousands of parts and dozens of embedded systems. 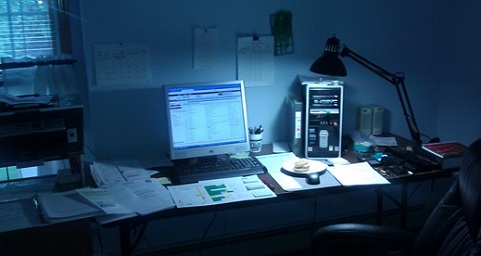 Thus, it makes sense that a systems engineer like New Jersey-based John Roselle would have more than one workspace for simultaneously planning, designing, and testing multiple systems. Roselle recently submitted images of his space and provided some interesting feedback when we asked him about it. My main work space for testing and debugging of circuits consists of nothing more than a kitchen table with two shelves attached to the wall. Shown in the picture (see above) a 265-V digital motor drive for a fin control system for an under water application. In a second room I have a computer design center. I design and test mostly motor drives for motion control products for various applications, such as underwater vehicles, missile hatch door motor drives, and test equipment for testing the products I design. John’s third workspace is used mainly for testing and assembling. At times there might be two or three different projects going on at once, he added. 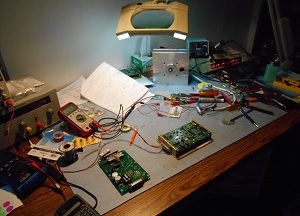 Do you want to share images of your workspace, hackspace, or “circuit cellar”? Send us your images and info about your space. Professional engineer Jason Long worked as an embedded systems designer for more than a decade. In 2010 he founded Engenuics Technologies. Jason lives in Victoria, BC, where he continues growing his company alongside the MicroProcessor Group (MPG) embedded systems hardware teaching program he developed in 2000. CIRCUIT CELLAR: In 2010 you founded your company Engenuics Technologies (www.engenuics.com) based on the success of the MicroProcessorGroup (MPG) program. Give us a little background. How did the MPG begin? JASON: MPG started way back in 2000 at the University of Calgary when I was doing my undergraduate studies. I figured out that embedded systems was exactly what I wanted to do, but struggled to find enough hands-on learning in the core curriculum programs to satisfy this new appetite. I was involved in the university’s Institute of Electrical and Electronics Engineers (IEEE) student branch, where someone handed me my first Microchip Technology PIC microcontroller and ran a few lunchtime tutorials about getting it up and running. I wanted more, and so did other people. I was also very aware that I needed to drastically improve my personal confidence and my ability to speak in public if I was going to have any luck with a career outside of a cubicle, let alone survive an interview to get a job in the first place. The combination of these two things was the perfect excuse/opportunity to start up the MPG to ensure I kept learning by being accountable to teach people new stuff each week, but also to gain the experience of delivering those presentations. I was blown away when there were almost 30 people at the first MPG meeting, but I was ready. Two things became very clear very quickly. The first was that, to be able to teach, you must achieve a whole new level of mastery about your subject, but it was also okay to say, “I don’t know” and find out for next week. The second was that I could, in fact, get my nerves under control as long as I was prepared and didn’t try to do too much. I’m still nervous every time I start a lecture, even 14 years later, but now I know how to use those nerves! The best part was that people really appreciated what I was doing and perhaps were a bit more tolerant since MPG is free. I found a love for teaching that I didn’t expect, nor did I get how rewarding the endeavor would be. When I was wrapping up the ninth year of the program, I considered giving it one more year and then calling it quits. I took a moment to look back at what the program was when I started and where it had come to—it had indeed evolved a lot, and I figured I had put in about 2,000 h by this point. It seemed like a waste to throw in the towel. I also looked at the relationships that had come from the program, both personally and professionally, and realized that the majority of my career and who I had become professionally had really been defined by my work with MPG. But the program—even though it was still just in Calgary—was too big to keep as a side project. I had $10,000 in inventory to support the development boards, and although all monies stayed in the program, there were thousands of dollars exchanging hands. This was a business waiting to happen, though I had never thought of myself as an entrepreneur. I was just doing stuff I loved. 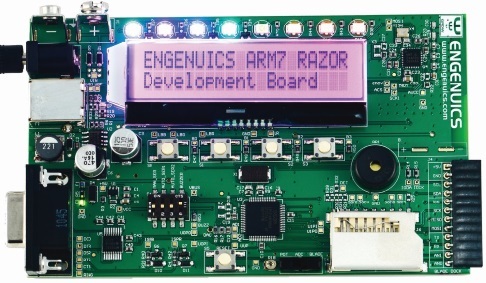 This ARM-based development board is made by Jason’s company, Engenuics Technologies. Around the same time I discovered SparkFun Electronics, and more importantly, I discovered the story of how the company got started by Nathan Seidie. That story begins almost exactly how MPG began, but clearly Nathan is a lot smarter than I am and has built an amazing company in the same time it took me to get to this point. I feel quite disappointed when I think about it that way, but thankfully I don’t think it’s too late to do what I should have done a long time ago. I hope to meet Nathan one day, but even if I don’t, I consider him a mentor and his story provides validation that the MPG platform and community may be able to grow and be sustainable. I think MPG/Engenuics Technologies can find similar success as SparkFun. We can do that without ever having to compete against SparkFun because what we do is unique enough. There might be a bit of overlap, but I’m always going to try to complement what SparkFun does rather than compete against it. We simply become another resource to feed the voracious and infinite appetite for information from students, hobbyists, and engineers. Win-win is always the way to go. I decided I should grow the program instead of ending it, so I started Engenuics Technologies, which would be built on the decade of MPG experience plus the decade of embedded design experience I had from the industry. It seemed like a pretty solid foundation on which to start a company! Surely I could promote all of the content and find students of the same mindset I was in when I started MPG? They could lead the program at different universities and develop those infinitely valuable communication and leadership skills that MPG fosters, except they’d have the advantage of not having to put in hundreds of hours to write all of the material. Even if groups of people weren’t playing with MPG, individuals could make use of the technical resource on their own and we could have a solid online community. I also wanted to keep students engaged beyond the single year of their engineer degrees in which MPG existed. CIRCUIT CELLAR: What other products/services does Engenuics Technologies provide? JASON: I describe Engenuics Technologies as a four-tier company as there are three significant aspects of the business in addition to MPG. The main purpose of the company is to fill a gap in the industry for specific training in embedded systems. There is very little formal training to be found for low-to-mid-level embedded hardware and firmware development and quality/value is often hit or miss. From teaching for 10 years while being an embedded designer for the same amount of time, I felt like I had the right skills to create great training. I had already created a LabVIEW course that I delivered internally for a company while I worked there, and people were blown away by the quality and content. I saw a huge need to develop embedded-specific training to help new graduates transition to the industry as well as junior engineers who were lacking in some fundamental engineering knowledge. We have an embedded boot camp course that is about 20% hardware and 80% firmware focused, which I think is essential for new engineering graduates getting into embedded design. Though the course is based specifically on a Cortex-M3 development board, we ensure that we focus on how to learn a processor so the knowledge can be applied to any platform. Engenuics Technologies has several courses now and we continue to offer those periodically though never as often as we would like, as we’ve become too busy with the other parts of the company. We finally got an office last August with an onsite training room, which makes the logistics much easier, and we’re ramping up the frequency of the programs we offer. CIRCUIT CELLAR: You earned your BSEE from the University of Calgary in 2002. Can you describe any of the projects you’ve worked while you were there? JASON: The professors at the U of C were a phenomenal bunch and it was a privilege to get to know them and work with them during my undergraduate studies. I remain in contact with many of them, and several are very good friends. Aside from blinking some LEDs on breadboards, the first complicated device I built was an attempt at the IEEE Micromouse competition. That proved to be a little much and my robot never did do anything beyond go forward, sense a wall, and then back up. 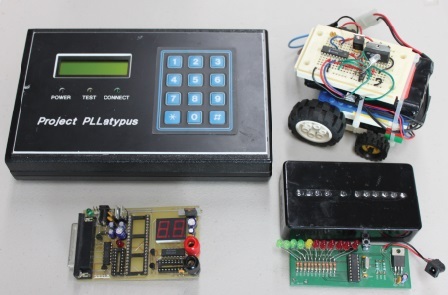 While studying at the University of Calgary, some of Jason’s first embedded designs included a programmable phase-locked loop project, a robot built for an IEEE Micromouse competition, an MPG dev board, and a binary clock. I originally thought I would base MPG around building robots, but that proved impossible due to cost. Building a robot is still on my bucket list. I’ll likely get there once my two boys are old enough to want to build robots. I continue to fantasize about building an autonomous quadcopter that can deliver beer. I better get busy on that before its commonplace! Our IEEE student branch had a Protel 99 SE license and somehow I learned how to design PCBs. The first board I designed was a binary clock that I still use. I then did a PIC programmer and later I built a combined development board and programmer for MPG. I also designed the PCB for our fourth-year Capstone design project, which initially was a very boring implementation of a phase-locked loop, but became a lot more fun when I decided to make it programmable with a keypad and an LCD. I brought all these things to my BW Technologies job interview and proudly showed them off. For any students reading this, by the way, landing your first engineering job is probably 5% technical, 10% GPA, and 85% enthusiasm and demonstrated interest and achievement. It’s really boring to interview someone who has done nothing extracurricular. 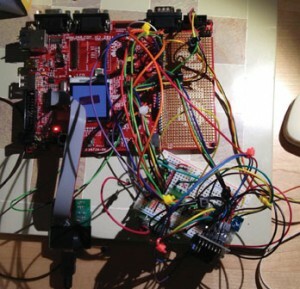 CIRCUIT CELLAR: How long have you been designing embedded systems? When did you become interested? JASON: My dad was a high school science teacher and my mom was a nurse, so I didn’t have a lot of technical influence growing up. I loved talking physics with my dad, and I’m one of the few engineers who can cook (thank you, mom). Aside from really liking LEGO and dismantling anything electronic (without ever a hope of putting it back together but always wondering what all those funny looking components did), I barely demonstrated any interest in EE when I was young. But somehow I figured out in grade 12 that EE was probably what I should study at university. I’m sure I still had visions of being a video game designer, but that nagging interest in learning what those funny components did steered me to EE instead of computer science. It wasn’t until my second year at university when someone gave me my first PIC microcontroller that I really knew that embedded was where I needed to be. That someone was a student named Sean Hum, a brilliant guy who is now an associate professor at the University of Toronto. CIRCUIT CELLAR: Which new technologies excite you? JASON: I particularly like the 2.4-GHz radio technologies that hold the potential to really make our environment interactive and intelligent. I think the world needs more intelligence to address the wasteful nature of what we have become whether it is by actively doing something like turning the lights or heat off when we’re not around, or by simply making us more aware of our surroundings. I love ANT+ and am just getting into BLE—obviously, smartphone integration will be critical. I think technology will drive change in education and I hope to see (and perhaps be a driving force behind) a more cohesive existence between academics and the industry. I hope MPG becomes a model to the industry of what can be achieved with not a lot of financial resources, but has immense payback for employees who become mentors and students who can connect with the industry much earlier and thus get more from their degree programs and graduate with substantially higher capabilities. You can read the entire interview in Circuit Cellar 289 (August 2014). NAN: Tell us about your company Logical Elegance. When and why did you start the company? What types of services do you provide? ELECIA: Logical Elegance is a small San Jose, CA-based consulting firm specializing in embedded systems. We do system analysis, architecture, and software implementation for a variety of devices. I started the company in 2004, after leaving a job I liked for a job that turned out to be horrible. Afterward, I wasn’t ready to commit to another full-time job; I wanted to dip my toe in before becoming permanent again. I did eventually take another full-time job at ShotSpotter, where I made a gunshot location system. Logical Elegance continued when my husband, Chris, took it over. After ShotSpotter, I returned to join him. While we have incorporated and may take on a summer intern, for the most part Logical Elegance is only my husband and me. I like consulting, it lets me balance my life better with my career. It also gives me time to work on my own projects: writing a book and articles, playing with new devices, learning new technologies. On the other hand, I could not have started consulting without spending some time at traditional companies. Almost all of our work comes from people we’ve worked with in the past, either people we met at companies where we worked full time or people who worked for past clients. 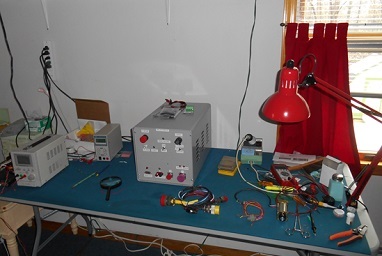 Here is Elecia’s home lab bench. She conveniently provided notes. NAN: Logical Elegance has a diverse portfolio. Your clients have ranged from Cisco Systems to LeapFrog Enterprises. Tell us about some of your more interesting projects. ELECIA: We are incredibly fortunate that embedded systems are diverse, yet based on similar bedrock. Once you can work with control loops and signal processing, the applications are endless. Understanding methodologies for concepts such as state machines, interrupts, circular buffers, and working with peripherals allows us to put the building blocks together a different way to suit a particular product’s need. For example, for a while there, it seemed like some of my early work learning how to optimize systems to make big algorithms work on little processors would fall to the depths of unnecessary knowledge. Processors kept getting more and more powerful. However, as I work on wearables, with their need to optimize cycles to extend their battery life, it all is relevant again. We’ve had many interesting projects. 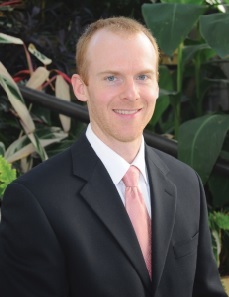 Chris is an expert in optical coherence tomography (OCT). Imagine a camera that can go on the end of a catheter to help a doctor remove plaque from a clogged artery or to aid in eye surgery. Chris is also the networking expert. He works on networking protocols such as Locator/ID Separation Protocol (LISP) and multicast. I’m currently working for a tiny company that hopes to build an exoskeleton to help stroke patients relearn how to walk. I am incredibly enthusiastic about both the application and the technology. That has been a theme in my career, which is how I’ve got this list of awesome things I’ve worked on: DNA scanners, race cars and airplanes, children’s toys, and a gunshot location system. The things I leave off the list are more difficult to describe but no less interesting to have worked on: a chemical database that used hydrophobicity to model uptake rates, a medical device for the operating room and ICU, and methods for deterring fraud using fingerprint recognition on a credit card. In the last few years, Chris and I have both worked for Fitbit on different projects. If you have a One pedometer, you have some of my bits in your pocket. The feeling of people using my code is wonderful. I get a big kick seeing my products on store shelves. I enjoyed working with Fitbit. When I started, it was a small company expanding its market; definitely the underdog. Now it is a success story for the entire microelectromechanical systems (MEMS) industry. Not everything is rosy all the time though. For one start-up, the algorithms were neat, the people were great, and the technology was a little clunky but still interesting. However, the client failed and didn’t pay me (and a bunch of other people). When I started consulting, I asked a more experienced friend about the most important part. I expected to hear that I’d have to make myself more extroverted, that I’d have to be able to find more contracts and do marketing, and that I’d be involved in the drudgery of accounting. The answer I got was the truth: the most important part of consulting is accounts receivable. Working for myself—especially with small companies—is great fun, but there is a risk. NAN: How did you get from “Point A” to Logical Elegance? ELECIA: ”Point A” was Harvey Mudd College in Claremont, CA. While there, I worked as a UNIX system administrator, then later worked with a chemistry professor on his computational software. After graduation, I went to Hewlett Packard (HP), doing standard software, then a little management. I was lured to another division to do embedded software (though we called it firmware). Next, a start-up let me learn how to be a tech lead and architect in the standard start-up sink-or-swim methodology. A mid-size company gave me exposure to consumer products and a taste for seeing my devices on retailer’s shelves. From there, I tried out consulting, learned to run a small business, and wrote a Circuit Cellar Ink article “Open Source Code Guide” (Issue 175, 2005). I joined another tiny start-up where I did embedded software, architecture, management, and even directorship before burning out. Now, I’m happy to be an embedded software consultant, author, and podcast host. NAN: You wrote Making Embedded Systems: Design Patterns for Great Software (O’Reilly Media, 2011). What can readers expect to learn from the book? ELECIA: While having some industry experience in hardware or software will make my book easier to understand, it is also suitable for a computer science or electrical engineering college student. It is a technical book for software engineers who want to get closer to the hardware or electrical engineers who want to write good software. It covers many types of embedded information: hardware, software design patterns, interview questions, and a lot of real-world wisdom about shipping products. 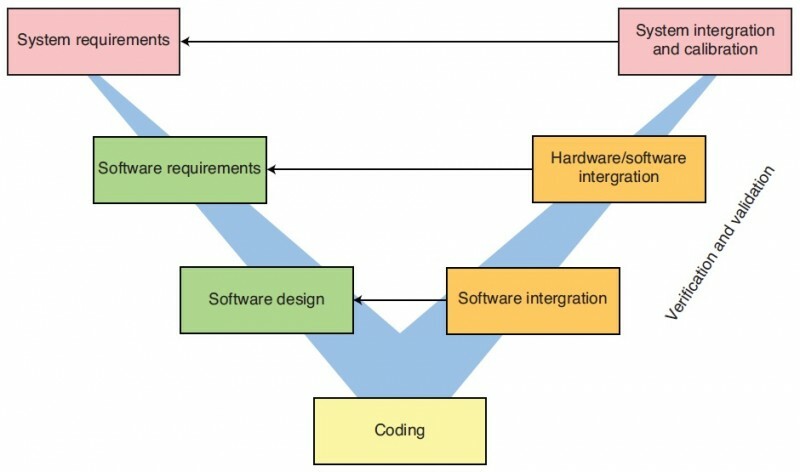 Making Embedded Systems is intended for engineers who are in transition: the hardware engineer who ends up writing software or the software engineer who suddenly needs to understand how the embedded world is different from pure software. Unfortunately, most college degrees are either computer science or electrical engineering. Neither truly prepares for the half-and-half world of an embedded software engineer. Computer science teaches algorithms and software design methodology. Electrical engineering misses both of those topics but provides a practical tool kit for doing low-level development on small processors. Whichever collegiate (or early career) path, an embedded software engineer needs to have familiarity with both. I did a non-traditional major that was a combination of computer science and engineering systems. I was prepared for all sorts of math (e.g., control systems and signal processing) and plenty of programming. All in all, I learned about half of the skills I needed to do firmware. I was never quite sure what was correct and what I was making up as I went along. As a manager, I found most everyone was in the same boat: solid foundations on one side and shaky stilts on the other. The goal of the book is to take whichever foundation you have and cantilever a good groundwork to the other half. It shouldn’t be 100% new information. In addition to the information presented, I’m hoping most people walk away with more confidence about what they know (and what they don’t know). Elecia was a judge at the MEMS Elevator Pitch Session at the 2013 MEMS Executive Congress in Napa, CA. NAN: How long have you been designing embedded systems? When did you become interested? ELECIA: I was a software engineer at the NetServer division at HP. I kept doing lower-level software, drivers mostly, but for big OSes: WinNT, OS/2, Novell NetWare, and SCO UNIX (a list that dates my time there). HP kept trying to put me in management but I wasn’t ready for that path, so I went to HP Labs’s newly spun-out HP BioScience to make DNA scanners, figuring the application would be more interesting. I had no idea. I lit a board on fire on my very first day as an embedded software engineer. Soon after, a motor moved because my code told it to. I was hooked. That edge of software, where the software touches the physical, captured my imagination and I’ve never looked back. NAN: Tell us about the first embedded system you designed. Where were you at the time? What did you learn from the project? ELECIA: Wow, this one is hard. The first embedded system I designed depends on your definition of “designed.” Going from designing subsystems to the whole system to the whole product was a very gradual shift, coinciding with going to smaller and smaller companies until suddenly I was part of the team not only choosing processors but choosing users as well. After I left the cushy world of HP Labs with a team of firmware engineers, several electrical engineers, and a large team of software engineers who were willing to help design and debug, I went to a start-up with fewer than 50 people. There was no electrical engineer (except for the EE who followed from HP). There was a brilliant algorithms guy but his software skills were more MATLAB-based than embedded C. I was the only software/firmware engineer. This was the sort of company that didn’t have source version control (until after my first day). It was terrifying being on my own and working without a net. I recently did a podcast about how to deal with code problems that feel insurmountable. While the examples were all from recent work, the memories of how to push through when there is no one else who can help came from this job. Elecia is shown recording a Making Embedded Systems episode with the founders of electronics educational start-up Light Up. From left to right: Elecia’s husband and producer Christopher White, host Elecia White, and guests Josh Chan and Tarun Pondicherry. ELECIA: I have a few personal projects I’m working on: a T-shirt that monitors my posture and a stuffed animal that sends me a “check on Lois” text if an elderly neighbor doesn’t pat it every day. These don’t get nearly enough of my attention these days as I’ve been very focused on my podcast: Making Embedded Systems on iTunes, Instacast, Stitcher, or direct from http://embedded.fm. The podcast started as a way to learn something new. I was going to do a half-dozen shows so I could understand how recording worked. It was a replacement for my normal community center classes on stained glass, soldering, clay, hula hooping, laser cutting, woodshop, bookbinding, and so forth. However, we’re way beyond six shows and I find I quite enjoy it. I like engineering and building things. I want other people to come and play in this lovely sandbox. I do the show because people continue to share their passion, enthusiasm, amusement, happiness, spark of ingenuity, whatever it is, with me. To sum up why I do a podcast, in order of importance: to talk to people who love their jobs, to share my passion for engineering, to promote the visibility of women in engineering, and to advertise for Logical Elegance (this reason is just in case our accountant reads this since we keep writing off expenses). NAN: What are your go-to embedded platforms? Do you have favorites, or do you use a variety of different products? I love Arduino although I don’t use it much except to get other people excited. I appreciate that at the heart of this beginner’s board (and development system) is a wonderful, useful processor that I’m happy to work on. I like having a few Arduino boards around, figuring that I can always get rid of the bootloader and use the Atmel ATmega328 on its own. In the meantime, I can give them to people who have an idea they want to try out. For beginners, I think mbed’s boards are the next step after Arduino. I like them but they still have training wheels: nice, whizzy training wheels but still training wheels. I have a few of those around for when friends’ projects grow out of Arduinos. While I’ve used them for my own projects, their price precludes the small-scale production I usually want to do. Professionally, I spend a lot of time with Cortex-M3s, especially those from STMicroelectronics and NXP Semiconductors. They seem ubiquitous right now. These are processors that are definitely big enough to run an RTOS but small enough that you don’t have to. I keep hearing that Cortex-M0s are coming but the price-to-performance-to-power ratio means my clients keep going to the M3s. Finally, I suppose I’ll always have a soft spot for Texas Instruments’s C2000 line, which is currently in the Piccolo and Delfino incarnations. The 16-bit byte is horrible (especially if you need to port code to another processor), but somehow everything else about the DSP does just what I want. Although, it may not be about the processor itself: if I’m using a DSP, I must be doing something mathy and I like math. ELECIA: I’m most excited about health monitoring. I’m surprised that Star Trek and other science fiction sources got tricorders right but missed the constant health monitoring we are heading toward with the rise of wearables and the interest in quantified self. I’m most concerned about connectivity. The Internet of Things (IoT) is definitely coming, but many of these devices seem to be more about applying technology to any device that can stand the price hit, whether it makes sense or not. Worse, the methods for getting devices connected keeps fracturing as the drive toward low-cost and high functionality leads the industry in different directions. And even worse, the ongoing battle between security and ease of use manages to give us things that are neither usable nor secure. There isn’t a good solution (yet). To make progress we need to consider the application, the user, and what they need instead of applying what we have and hoping for the best. Tracing tools monitor what is going in a program’s execution by logging low-level and frequent events. Thus tracing can detect and help debug performance issues in embedded system applications. 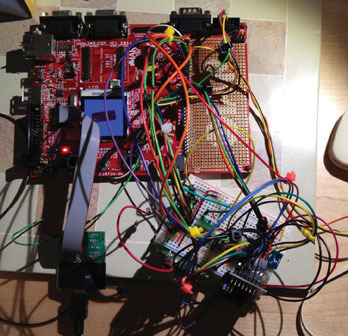 In Circuit Cellar’s April issue, Thiadmer Riemersma describes his DIY tracing setup for small embedded systems. His system comprises three parts: a set of macros to include in the source files of a device under test (DUT), a PC workstation viewer that displays retrieved trace data, and a USB dongle that interfaces the DUT with the workstation. Small embedded devices typically have limited-performance microcontrollers and scarce interfaces, so Riemersma’s tracing system uses only a single I/O pin on the microcontroller. Compactness of the information transferred from the embedded system to the workstation [which decodes and formats the trace information] is important because the I/O interface that is used for the transfer will probably be the bottleneck. Assuming you are transmitting trace messages bit by bit over a single pin using standard wire and 5- or 3.3-V logic levels, the transfer rate may be limited to roughly 100 Kbps. My proposed trace protocol achieves compactness by sending numbers in binary, rather than as human-readable text. Common phrases can be sent as numeric message IDs. The trace viewer (or trace ‘listener’) can translate these message IDs back to the human-readable strings. One important part of the system is the hardware interface—the trace dongle. Since many microcontrollers are designed with only those interfaces used for specific application needs, Riemersma says, typically the first step is finding a spare I/0 pin that can be used to implement the trace protocol. This is the trace dongle. Photo 1 shows the trace dongle. To transmit serial data over a single pin, you need to use an asynchronous protocol. Instead of using a kind of (bit-banged) RS-232, I chose biphase encoding. Biphase encoding has the advantage of being a self-clocking and self-synchronizing protocol. This means that biphase encoding is simple to implement because timing is not critical. The RS-232 protocol requires timing to stay within a 3% error margin; however, biphase encoding is tolerant to timing errors of up to 20% per bit. And, since the protocol resynchronizes on each bit, error accumulation is not an issue. Figure 1 shows the transitions to transmit an arbitrary binary value in biphase encoding—to be more specific, this variant is biphase mark coding. In the biphase encoding scheme, there is a transition at the start of each bit. Figure 1: This is an example of a binary value transferred in biphase mark coding. For a 1 bit there is also a transition halfway through the clock period. With a 0 bit, there is no extra transition. The absolute levels in biphase encoding are irrelevant, only the changes in the output line are important. In the previous example, the transmission starts with the idle state at a high logic level but ends in an idle state at a low logic level. Listing 1 shows an example implementation to transmit a byte in biphase encoding over a single I/O pin. The listing refers to the trace_delay() and toggle_pin() functions (or macros). These system-dependent functions must be implemented on the DUT. 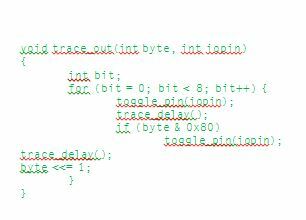 The trace_delay() function should create a short delay, but not shorter than 5 µs (and not longer than 50 ms). The toggle_pin() function must toggle the output pin from low to high or from high to low. Listing 1: Transmitting a byte in biphase encoding, based on a function to toggle an I/O pin, is shown. The biphase encoding signal goes from the DUT to a trace dongle. The dongle decodes the signal and forwards it as serial data from a virtual RS-232 port to the workstation (see Photo 2 and the circuit in Figure 2). Photo 2: The trace dongle is inserted into a laptop and connected to the DUT. Figure 2: This trace dongle interprets biphase encoding. The buffer is there to protect the microcontroller’s input pin from spikes and to translate the DUT’s logic levels to 5-V TTL levels. I wanted the trace dongle to work whether the DUT used 3-, 3.3-, or 5-V logic. I used a buffer with a Schmitt trigger to avoid the “output high” level of the DUT at 3-V logic, plus noise picked up by the test cable would fall in the undefined area of 5-V TTL input. Regarding the inductor, the USB interface provides 5 V and the electronics run at 5 V. There isn’t room for a voltage regulator. Since the USB power comes from a PC, I assumed it might not be a “clean” voltage. I used the LC filter to reduce noise on the power line. The trace dongle uses a Future Technology Devices International (FTDI) FT232RL USB-to-RS-232 converter and a Microchip Technology PIC16F1824 microcontroller. The main reason I chose the FT232RL converter is FTDI’s excellent drivers for multiple OSes. True, your favorite OS already comes with a driver for virtual serial ports, but it is adequate at best. The FTDI drivers offer lower latency and a flexible API. 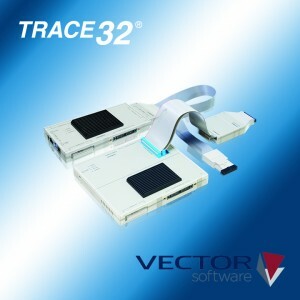 With these drivers, the timestamps displayed in the trace viewers are as accurate as what can be achieved with the USB protocol, typically within 2 ms. I chose the PIC microcontroller for its low cost and low pin count. I selected the PIC16F1824 because I had used it in an earlier project and I had several on hand. The microcontroller runs on a 12-MHz clock that is provided by the FTDI chip. The pins to connect to the DUT are a ground and a data line. The data line is terminated at 120 Ω to match the impedance of the wire between the dongle and the DUT. The cable between the DUT and the trace dongle may be fairly long; therefore signal reflections in the cable should be considered even for relatively low transmission speeds of roughly 250 kHz. That cable is typically just loose wire. The impedance of loose wire varies, but 120 Ω is a good approximate value. The data line can handle 3-to-5-V logic voltages. Voltages up to 9 V do not harm the dongle because it is protected with a Zener diode (the 9-V limit is due to the selected Zener diode’s maximum power dissipation). The data line has a 10-kΩ to 5-V pull-up, so you can use it on an open-collector output. The last item of interest in the circuit is a bicolor LED that is simply an indicator for the trace dongle’s status and activity. The LED illuminates red when the dongle is “idle” (i.e., it has been enumerated by the OS). It illuminates green when biphase encoded data is being received. After the dongle is built, it must be programmed. First, the FT232RL must be programmed (with FTDI’s “FT Prog” program) to provide a 12-MHz clock on Pin C0. The “Product Description” in the USB string descriptors should be set to “tracedongle” so the trace viewers can find the dongle among other FTDI devices (if any). To avoid the dongle being listed as a serial port, I also set the option to only load the FTDI D2XX drivers. To upload the firmware in the PIC microcontroller, you need a programmer (e.g., Microchip Technology’s PICkit) and a Tag-Connect cable, which eliminates the need for a six-pin header on the PCB, so it saves board space and cost. The rest of the article provides details of how to create the dongle firmware, how to add trace statements to the DUT software being monitored, and how to use the GUI version of the trace viewer. The tracing system is complete, but it can be enhanced, Riemersma says. “Future improvements to the tracing system would include the ability to draw graphs (e.g., for task switches or queue capacity) or a way to get higher precision timestamps of received trace packets,” he says. For Riemersma’s full article, refer to our April issue now available for membership download or single-issue purchase.